I am addicted. To making lists. Stuff to do. To pack. To finish. To brainstorm. To develop. Stuff that can be checked off, bullet-pointed, or crossed off. And I love Knock Knock. Especially all of their notepads. 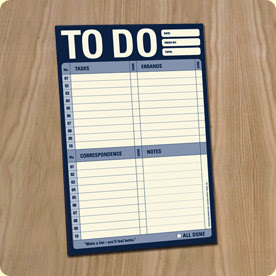 The "To Do" list is my favorite. On the flights home, no fewer than six lists found their way into my bag...stuff to do last night, this weekend, to pack next week, to follow up on from last weekend, projects remaining this week, and baby stuff. I found this magazine in the airport, and I love it. Heading to the store tonight for the 5 nights of meals in the current issue...can't wait to try them. Loved waking up this morning on the farm. It was the longest I've been away from home and Doc since the wedding. You know Grandma is a serial list maker. Did you check out the insides of her cabinets while you were there?